When I wrote my initial post on mindfulness practice, I was a little over two weeks into the 6-week program at Masterpeace Studios. Our group, which meets for two hours on Monday nights, has now met four times. We took a week off of meeting between the 3rd and 4th weeks due to a conflict with the instructor’s schedule. This break was nice for two reasons. First, it just happened to fall during a very busy week, when I was prepping for and teaching CyclingSavvy and Matthew had a couple of other weekday evening commitments. Second, the break effectively added a week to the workshop, building in an additional seven days to be held accountable for practicing. Of course, no one is judging you, other than perhaps yourself, if you don’t practice (and you shouldn’t be judging yourself because mindfulness is all about nonjudgmental awareness), but having the workbook to record daily practice, and knowing that I am doing this as part of a group, is quite motivating. That extra week was also the most challenging to my daily practice, given the previously mentioned busyness, but I made time for some kind of formal practice every day. In general, I find formal practice, i.e., sitting down at a specific time with the intention of practicing, much easier than informal practice (e.g., being mindful during an activity of daily living, such as brushing your teeth or washing dishes). I picked flossing my teeth as my activity for informal mindfulness, and it’s really hard to reign-in my mind (maybe a time of day issue?). My work situation, both working part-time and working from home, makes it fairly easy for me to fit formal practice into my day during 4/5 of weekdays. Mid-morning and mid-afternoon are pretty good times for me. The days when I am home with Gabriel (Wednesdays and Sundays) are more challenging. On Sundays, I can get some help from Matthew during the day. On Wednesdays, I’m limited to nap time or the evening, after G is in bed. For mindfulness of breathing, I really like guidance (i.e., listening to an audio track) to get started, but I’m finding that after 2-3 minutes, I’m ready for silence. Most guided tracks have talking (i.e., guidance) interspersed with moments of silence. To have the best of both worlds, I’ve been using a meditation timer along with the “Mindfulness of Breath” track on the CD. I set the meditation timer for the total time I want to practice (10-15 minutes usually, at this point), start the track, and then, when I’m ready, stop the track and sit in silence with my breathing until the timer chimes. I’m not sure how I will do when the class, and the external incentive to practice, ends. Keeping a log of my daily practice seems helpful, so I plan to continue that. I’d welcome any tips or suggestions from those of you who have had success in incorporating regular meditation (mindfulness-based or otherwise) into your daily lives. 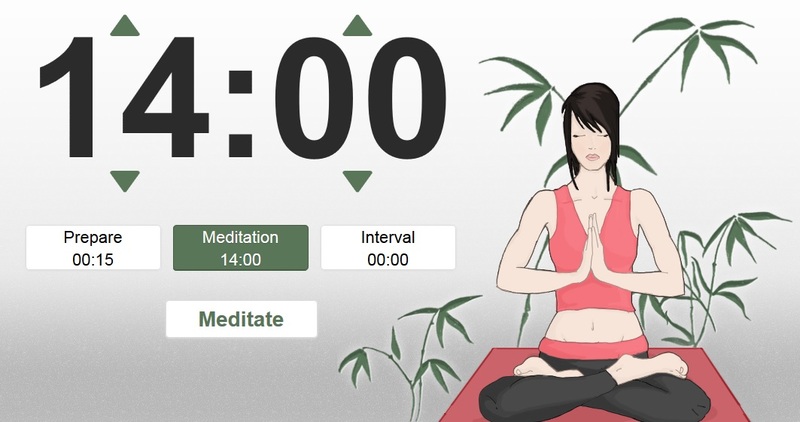 For a timer, I like OnlineMeditationTimer.com (also available as an app, if you have a phone that’s smarter than mine). Here is a link to an Awareness of Breath Meditation that is similar to the one I use. I also like this Standing Mindful Yoga sequence. I have found that parking my car a little farther away on campus and walking gives me some good time for thinking and clearing my head. Thanks for the suggestion. “Mindful walking” is one of the practices we cover in the course, but it’s not one I’ve integrated much, yet.